As part of common maintenance and administration tasks, it is of critical importance to always be able to rely on backups if you need to restore your project to a previous state, should an unexpected event occur. Restoring your project to a previous state when having a database backup is a simple procedure for a Bizagi System, given that Bizagi is data-driven. Backups in such types of tasks are mainly created as a contingency measure. Restoring a database backup should only be considered as a contingency measure to restore a given environment to a previous state, or to move an environment's database to a new location. This means that a development environment backup should only be restored in the same development environment, and a production environment backup should only be restored in the same production environment. To create environments, Bizagi offers its Deployment options. If you are using an Oracle database instance as the database engine for a Bizagi project database, perform the backup-and-restore operations through Oracle's Export and Import utility. If you are using a Microsoft SQL Server database as Bizagi's database instead, refer to SQL Server Backup and Restore. Keep in mind that case attachments are not stored within the backup itself. The installed client version will most likely differ according to the bit version (32-bit or 36-bit) supported by the database server system. It is required that the Oracle client's version used in the export match the client's version used in the import. Ensuring that these character sets are the same one or a compatible one, is essential for Oracle’s export and import utilities to maintain the integrity of the information (otherwise, information contained in the database can become altered). If you have more than one Oracle client installed where you will use the export and import utilities, make sure that the ORACLE_HOME environment variable is properly set to the Oracle client used by Bizagi. If you are moving a Development project to a new server, and wish to keep your existing cases (Process instances), take into account that file attachments are not stored in the database but on Automation Server server (by default), or a file server or ECM, if configured. If this is the case and you are using Automation Server server as the path for the cases' uploaded files, moving the attachment files would be necessary. 1. 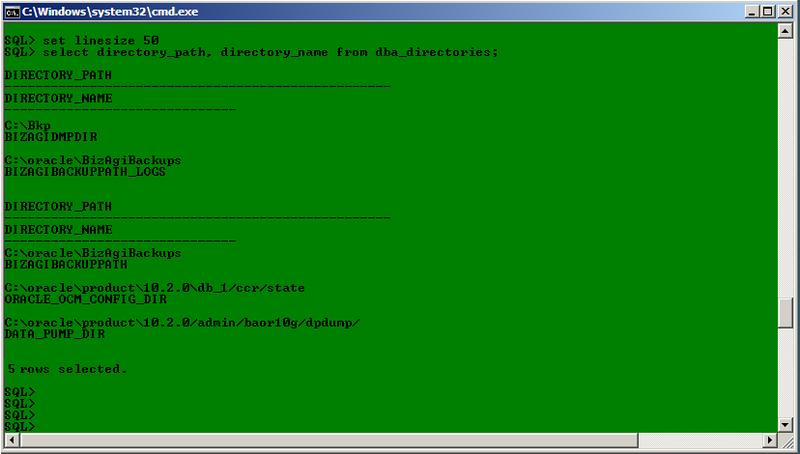 The export and import utilities are run using DOS commands with use of command line parameters (which are known to a DBA). You may choose to use a parameters file if it is useful. There is more than one way to use Export or Import capabilities, such as the use of RMAN, however this article illustrates the way recommended by Bizagi. You can use RMAN as long as you are an experienced userand can guarantee that the complete information will be considered for backup and restore purposes. 2. Managing an Oracle database of a Bizagi project will require at some point (for a specific instruction in the import), having at hand the credentials to connect as a user with privileges (for example, using the BizagiAdmon user). 3. After you perform the export or import of an Oracle database, it is imperative to review the execution logs, so that any possible errors and warnings thrown in the export and import are handled and solved, or verified as "OK". Regarding errors, an issue that can show up and that needs immediate resolution, is when a tablespace in Oracle runs out of space (and cannot be extended) during an import. This type of error will not stop the import, but can leave the information incomplete and without integrity. The BizagiAdmon user must have already been created in the given Oracle database instance. A Bizagi project creation requires that the BizagiAdmon user is previously created. The Data Pump utility provides a mechanism for transferring data objects between Oracle databases. Here is how to use the Datapump export utility to backup all the information in a Bizagi project from into a dmp file. To make use of the DataPump export, you need to specify as a parameter the directory in which the .dmp backup will be saved. •%BIZAGIADMON_USER_PASSWORD% is the password for the BizagiAdmon user. •%DATABASE_SERVER% is the name of the Oracle database server. •%SERVICE_PORT% is the port number in which the Oracle database services are listening. •%SERVICE_NAME% is the alias to your database instance. Once you have at hand the name of the directory you will use, log off (disconnect) from your Oracle instance’s BizagiAdmon session. 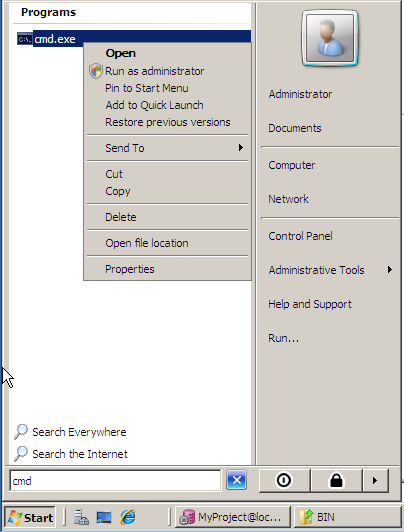 Use a command prompt to execute the export commands. The characteristics of the import operation are determined by the export parameters you specify. •%SCHEMA_USER_PASSWORD% is the password for the user with system rights (BizAgiAdmon). •%SCHEMA_USER_TO_EXPORT% is the name of the Bizagi project. •%BIZAGI_BACKUP_PATH% should be "BizAgiBackupPath" by default if no customization was done, according to step #1 (this parameter is the name for the directory on which the backup is located). •%EXPORT_FILE% is the path and filename in which the exported information was saved (the .dmp created when running the export). •%EXPORT_LOG% is the path and filename in which the import log will be recorded. This file commonly uses the .log file extension. For more information about Oracle's DataPump import and export utility (available from Oracle 10g version databases), refer to external links from the source: http://www.orafaq.com/wiki/Data_Pump. After the export execution, check for and resolve any possible errors. To do this, go through the log recorded in the previous step once the export has finished. This log will be located at the path and filename specified as "%EXPORT_LOG%". The export utility will use the character set defined for your Oracle client. Therefore, and as mentioned at the prerequisites section, this character set should be the same or a compatible one to that defined for the database server. In addition, the character set must also be the same or a compatible one to that involved when using the import utility. •This .dmp file was previously created through the DataPump export (manually using the expdp command). •This .dmp file was created by Bizagi. This is done automatically when launching a project upgrade or a deployment. Backup files created by Bizagi will be found at the "backup path" specified when configuring an Oracle instance to work with Bizagi (prerequisite of Bizagi project creation with Oracle databases). The DataPump import (impdp command) presented in this section will not restore dmp backup files created through the traditional export utility (exp command). Such dmp backup files not considered by this approach were manually created when using the exp command. To importing a dmp file created with the traditional export utility, needs to be done with the traditional import utility (imp command) described in the section above. For the DataPump import operation carried out to restore information, it is necessary that the schema user is not in use (has no active connections). Take into account, that Bizagi Scheduler's service will certainly have active connections if it is in a started status. If this is so, you need to stop the Scheduler service. You can also force kill active connections (by using the command below), but under your responsibility and controlling which specific sessions you are ending. Additionally, validate and guarantee that there are no users working at that moment in the related Bizagi project (user schema). When you restore an existing Bizagi project, the current schema user representing this project is deleted. Note that %SCHEMA_USER_TO_IMPORT% is the name of the Bizagi project. The schema user to restore the Bizagi project is created again (as blank) through a Bizagi stored procedure. To use the DataPump import, you will need to specify as a parameter the directory the .dmp backup is in. Once you have the name of the directory you will use, log off (disconnect) from your Oracle instance’s BizagiAdmon session. A command prompt to execute the import commands. Perform the DataPump import parameter specification. The parameters are completely different for those used by the traditional import utility. •%SCHEMA_USER_TO_IMPORT% is the name of the Bizagi project. •%BIZAGI_BACKUP_PATH% should be "BizAgiBackupPath" by default if no customization was done, according to step #4 (this parameter is the name for the directory on which the backup is located). •%EXPORT_FILE% is the path and file name in which the exported information was saved (the .dmp created when running the export). •%IMPORT_LOG% is the path and file name in which the import log will be recorded. This file commonly uses the .log file extension. You run the import while connected as the schema user whose objects (Bizagi project) will be restored (the same user and password as specified in step #3). After the DataPump import execution, check for and solve any errors (no errors should be shown when performing an import in Bizagi). To do this, go through the log recorded for this operation once the import has finished. This log will be located by the path and file name specified as "%IMPORT_LOG%". The import should finish correctly without warnings and having successfully enabled Bizagi's constraints. The import utility will use the character set defined for your Oracle client. Therefore, and as mentioned in the prerequisites section, this character set should be the same or a compatible one as the one defined for the database server. In addition, the character set must also be the same or a compatible one as that involved when using the export utility. Click for more information about this option in the Management Console.